Most well-educated immigrants speak mainly or only English at work, as do most of those who arrived as young children. So do most people (58%) in the highest-income immigrant households, a finding that could reflect their higher education levels. Most Puerto Ricans born on the island speak mainly or only English at work, as do 42% of South American immigrants. So do 34% of Dominicans, 32% of Central Americans, 26% of Cubans and 24% of Mexicans. 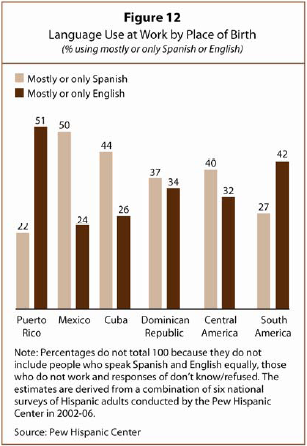 (Figure 12) That is more than double the share of each group that speaks mainly or only English at home. 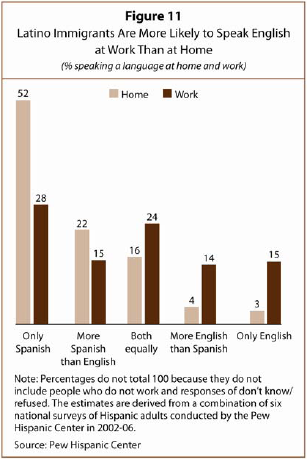 The U.S.-born adult children of Latino immigrants are much more likely to speak English at work, but not all do. Two-thirds of the second generation say they use mainly or only English on the job. That rises to 80% for the third and higher generation. Looked at from another perspective, more than a few native-born Latinos use some Spanish in the workplace. Just 7% speak only Spanish or mainly Spanish on the job, in contrast to the 43% of immigrants who do. But an additional 19% use English and Spanish equally, compared with 24% of immigrants.